Katmai National Park has been holding its annual Fat Bear Week over the past few days. Complete with a March Madness type bracket, the park has been posting before and after pictures of various bears, in a head to head, or possibly, belly to belly, face off. 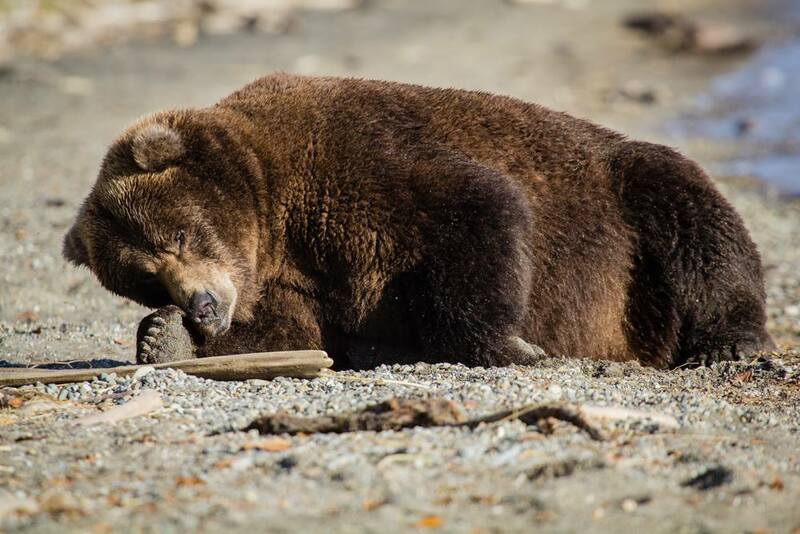 Highlighting how much weight brown bears need to put on over the summer to get through hibernation, Katmai has found a unique way to raise public awareness. Two bears now go belly to belly for the 2018 title of Fattest Bear of Katmai. First we have Bear #409, also known as Beadnose. Beadnose comes into the championship round having beat out three time champion Otis. Challenging Beadnose is Bear #747. This Bear carries a lot of weight, but no nickname. Although, I expect that will change next spring. I have to admit, 747 is appropriate, just look at that wide body. I believe voting closes today at 3 pm Alaska time on the Katmai Facebook page. A curious brown bear approached a visitor in Katmai National Park, and pawed at the visitor’s pant leg recently. That bear then wandered off. In a second incident, a brown bear was being chased by another brown bear through Brooks Camp, and a worker at Brooks Lodge was “pawed”. Neither bear, nor person was injured in the pawings. Katmai draws a large concentration of brown bears once the salmon start to run, which also brings the visitors to view the fishing bears. 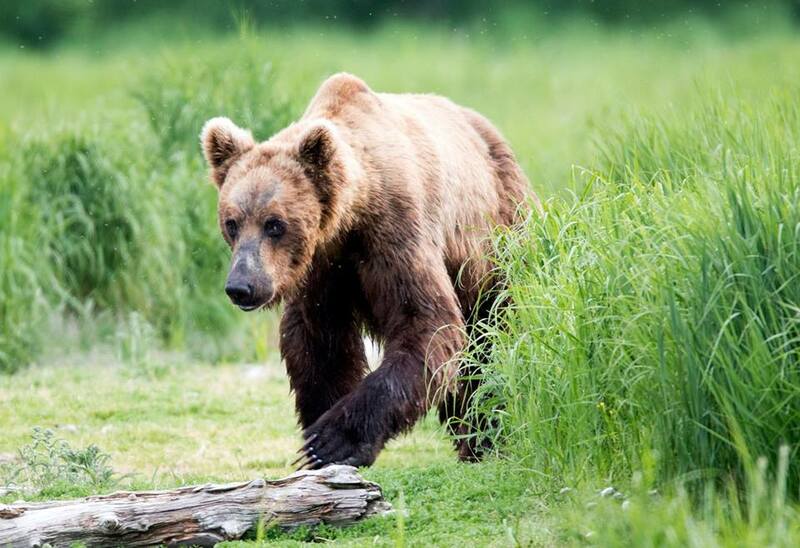 Some interaction would be expected, but what is really unusual about these events, is that the last time a bear made physical contact with a human in Katmai was 20 years ago. That really is a phenomenal safety record, especially with the unpredictability of both species. 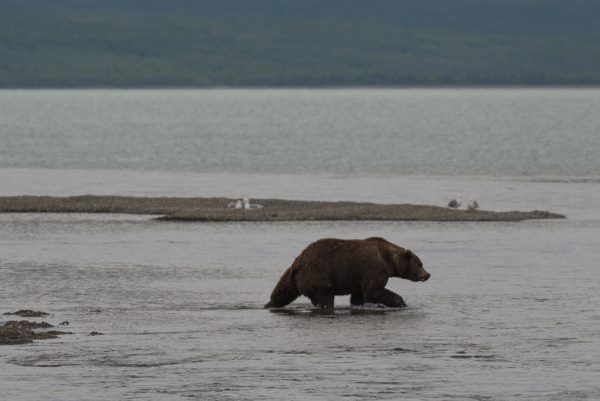 Park Rangers believe the main cause of the interactions, is due to the high number of subadult bears at Brooks River this year. A subadult is a bear between 2.5 and 5 years old. They naturally like to chase each other, and are trying to feel out their place in the hierarchy. 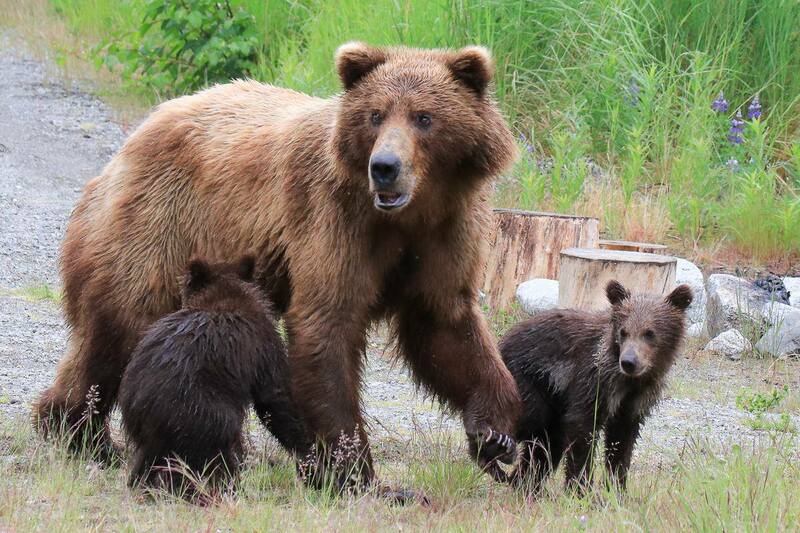 The last time Katmai had a similar number of subadult brown bears, was roughly 20 years ago. 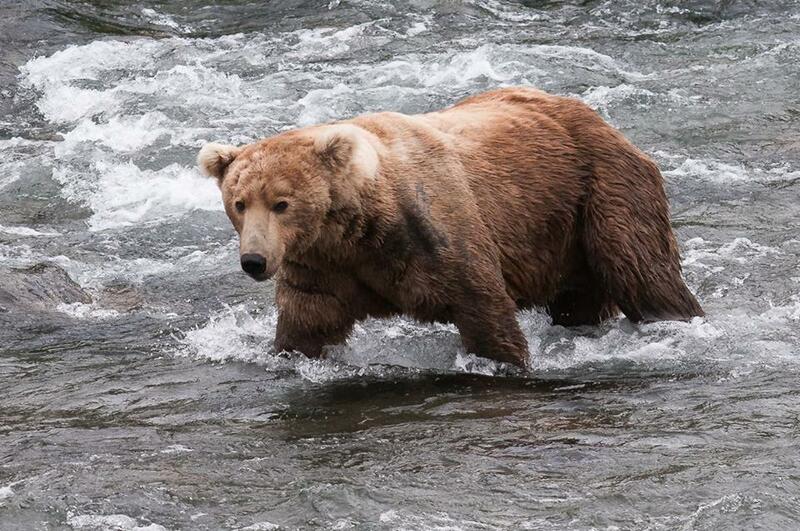 Now that the salmon are starting to return to Brooks River, the bears are coming into Brooks Falls to fatten up. The Katmai Bear Cam is getting to be a little more interesting of late too. There are approximately 2200 brown bears within the boundaries of Katmai National Park & Preserve at any given time. The Alaska Peninsula has more bears as residents than people. Most of the bears that come to Brooks Falls are numbered, as a way to keep track of them. Many of the regular bears receive names from the rangers and biologists that study them. The oldest known bear in the park, is Bear #410, she carries the nickname “Four-Ton”. A 29 year old female. Four-Ton is one of the largest females in the park. When the salmon are running, 410 is fishing, and she doesn’t care who is around. She often fishes in the midst of large males, and she doesn’t seem to be bothered by people either. For fans of the Bear Cam, Bear #480 is a favorite. Fondly known as “Otis”, 480 is the oldest known male bear in the park at 22 years old. Otis just recently returned to the falls, and was seen catching a nice salmon and taking it back to his island to eat in peace. He is known for having the most efficient salmon catching technique of the Brooks Falls regulars. The first spring cubs of the year have shown up for fishing lessons. There’s a new bear in town, and he has been saddled with the number 503. Look at those claws. 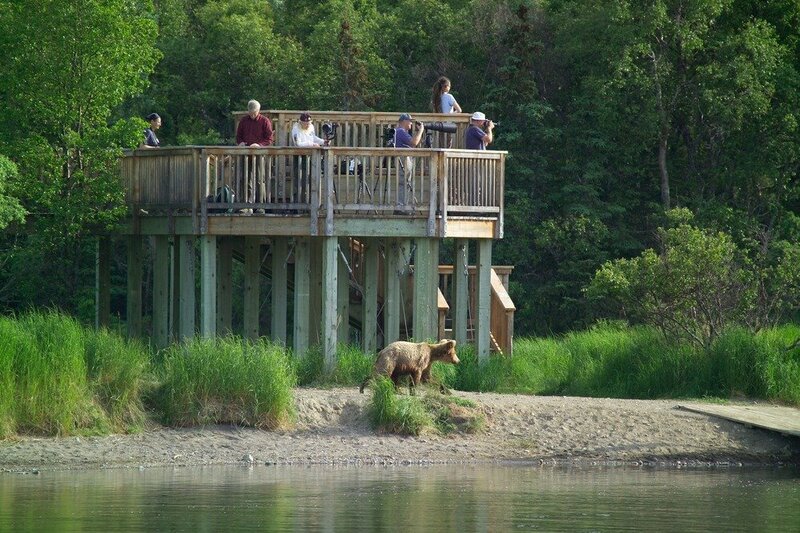 Bear #634 has also returned to Brooks River. Known as “Popeye”, 634 is an aggressive bear, and is known to steal fish from smaller bears. It should be noted, that 2018 is the 100th Anniversary of Katmai National Park. Happy birthday! The Katmai Bear Cam, which overlooks Brooks Falls in Katmai National Park & Preserve, is back up and running. Thanks to the folks at the NPS and explore.org for the cam. Just prior to posting, I took a quick view, and there were no bears to be seen yet. Hopefully, there will actually be salmon down there for the bears. 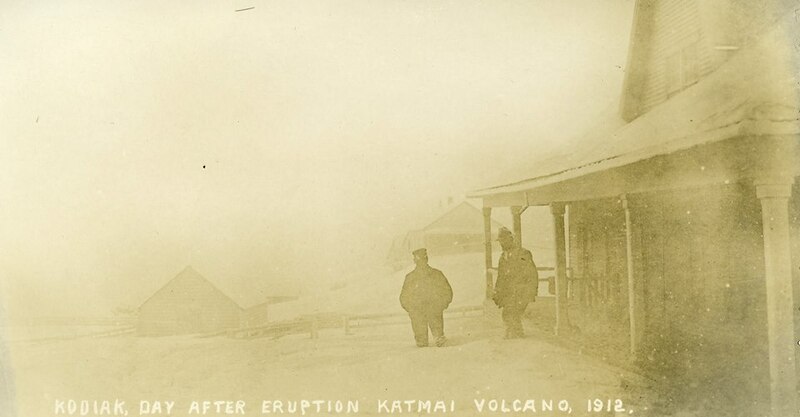 The Alaskan community of Kodiak one day after the eruption of Novarupta in 1912. Over a foot of ash fell on the town, collapsing roofs and engulfing the area in near total darkness. Thanks to the fine folks at explore.org, the Bear Cam is back up at Brooks Falls in Katmai National Park & Preserve. 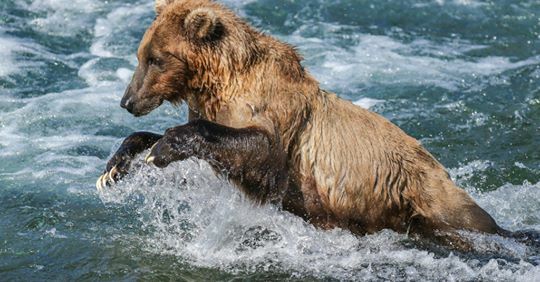 The salmon are running (and jumping), so follow the link at the top, and check out the dining habits of some Alaskan brown bears. The Katmai National Park Bear Cam is back up and running for the season. The camera overlooks Brooks Falls in the park, where the bears congregate to fish the salmon run. The 6395 square mile park was established as a National Monument in 1918. Located on the Pacific side of the Alaska Peninsula, Katmai is home to approximately 2200 brown bears. It is considered to be one of the Seven Wildlife Wonders of the World. The Bear Cam has once again been set up by explore.org. The link is below.